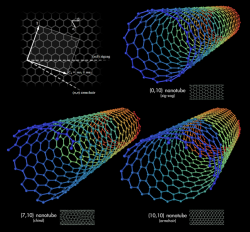 Carbon NanotubesCourtesy MstroeckAh, the potential uses of carbon nanotubes. You could make bullet-stopping combat jackets, stronger cement, stronger and lighter sports equipment, a space elevator, or.......a cupid. A student from Brigham Young University made a teeny cupid using carbon nanotubes. Though this cupid may not impact society the way a space elevator would, it's still pretty amazing how researchers are able to create things using such tiny building blocks. We've had much discussion on this blog over the winter over the plight of Solo the Bear, which was found hibernating under a cabin in northern Minnesota. The latest, and final, part of the story is carried today in the Star Tribune. Here's a link to the prior discussion of Solo.